NOAA All Hazards Weather Radio station KWO39 serves marine interests on southern Lake Michigan and the Illinois and Indiana lakeshore, from a 300 Watt transmitter at the Willis Tower in downtown Chicago. The nominal effective range of the transmitter is about 40 miles. 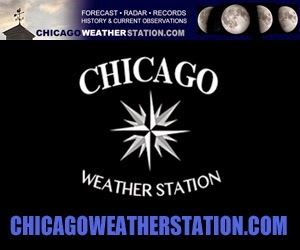 Continuous 24 hour programming is provided from the National Weather Service Chicago Forecast Office, located in southwest suburban Romeoville. A map of the listening area is shown below, with Specific Area Message Encoder codes shown for each county. Severe weather watches and warnings are tone-alerted for all counties shaded in blue. Tone alarm tests for KWO39 occur each WEDNESDAY at approximately 11 AM.